CO 14 sts using crochet cast on. Work 3 rows K1 P1 ribbing. Work 2 rows St st, beginning with a K row. Repeat from * to ** once. Work 2 rows K1 P1 ribbing. Cast off in K1 P1. With wrong sides held together, sew sides of sleeves. CO 22 sts using crochet cast on. K1, Ssk, K to last 3 sts, K2tog, K1. Repeat from *** to **** once. With wrong sides held together, sew sides of panels together, leaving spaces for sewing the sleeves in place. CO 20 sts using crochet cast on. Repeat from * to ** two times. Cut yarn and draw yarn end through remaining loop to finish. 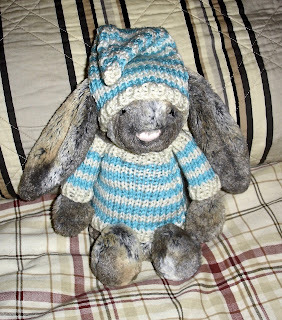 With wrong sides held together, sew sides of hat, leaving holes on either side for the ears. 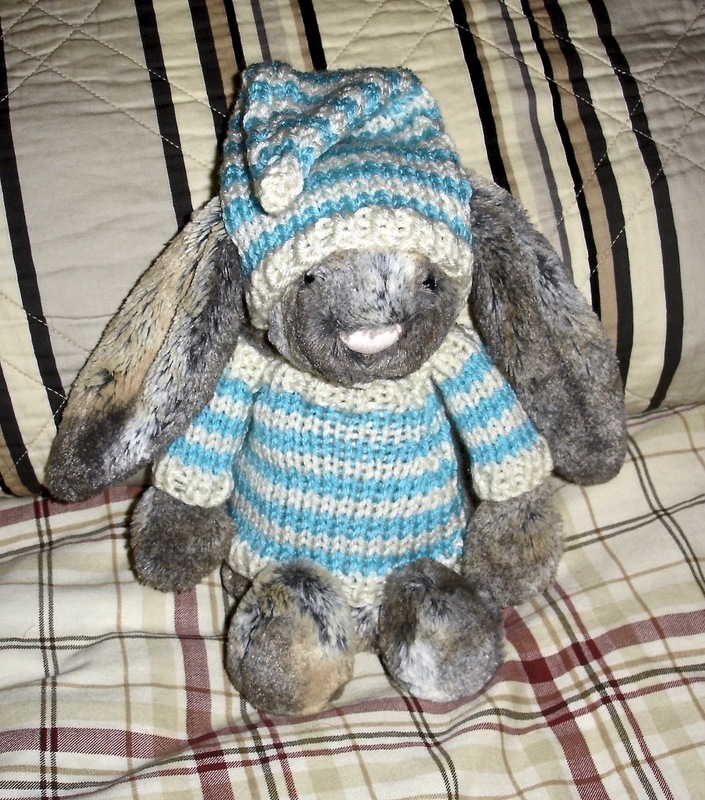 Hi, which size of Jellycat bunny is this designed to fit? Hi! The clothes are designed for the medium version (which I think is approx. 12 inches).